Construction was completed on the originally building in 1871 by the French during their occupation. The building was then named Norodom Palace and served as the Governor’s residence. For a brief period in 1945 the palace became the headquarters of the Japanense during a strange period where the Vietnamese hoped that the Japenese would make better rulers than the French. Following Japan’s defeat in WWII the palace returned to French hands. Following the French defeat in Dien Bien Phu in 1954 they with drew from Vietnam but were replaced by the Americans. 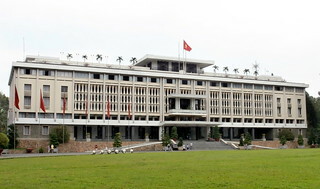 The palace was renamed Independence palace and became the residence of the Prime Minister of the Republic of Vietnam (South Vietnam). In 1962 the palace was bombed by two planes from the Saigon Army, destroying the left wing. The prime minister, Ngo Dinh Diem, ordered the demolition of the remaining building and construction of the current palace. The new palace features less french influence and a combination of modern and oriental architecture. Construction was completed in 1966. The prime minister never saw the new palace as he was assassinated in 1963. The change doesn’t end there. On April 30, 1975, tanks from the LIberation Army crashed through the main gates, ending 30 years of conflict between the North and South Vietnamese and beginning the reunification of Vietnam under the leadership of the Vietnamese Communist party. The fulfilment of Ho Chi Minh’s dreams. The palace was then renamed a final time to its current title, Reunification Palace, and it formal role as the residence of the head of state ended. Now a days the palace serves primarily as a tourist attraction, having an excellent free english speaking tour leaving every 15 minutes. Definitely a must do if you are here.